Khayhan, K, Hagen, F, Pan, W, Simwami, S, Fisher, M.C, Wahyuningsih, R, … Boekhout, T. (2013). 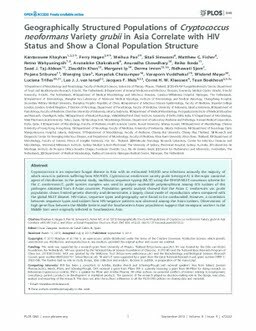 Geographically Structured Populations of Cryptococcus neoformans Variety grubii in Asia Correlate with HIV Status and Show a Clonal Population Structure. PLOS ONE.